Sony Xperia Ear Duo wireless earbuds will be up for grabs in May for $279.99. Pre-orders for the ‘open ear’ headset started today at Amazon. So what makes this headset so special that it deserves to have such a high price? When I first came across this price tag I wondered the same and I decided to dig in a bit and discover what makes them so special. This Ear Duo is the exact opposite of the company’s famous noise-cancelling headphones. This headset will provide you with a dual listening experience that will combine your music with the environmental sounds around you. Now I am a huge fan of cancelling out the noise around me but may be that’s not for everybody. You will be able to receive audio notifications about your calendar, news updates etc. The headset also comes with a Google Assistant and Siri integration and you can pair it with whatever device you use. The Spatial Acoustic Conductor, developed by Sony’s in-house technology incubator Future Lab Program, allows the sound generated behind the ear by the unit ́s driver to be transmitted directly into the ear. The specially designed ring supporter surrounds the ear canal so your music can blend seamlessly with sounds from your environment. Previously after the CES in January, we believed that the Ear Duo will make the noise around us sound like music. Now we know that this device will make the sounds around us sound less like noise and will allow us to carry out conversations without being distracted from loud music. But what if you don’t want to be disturbed by noise from the outside world? What if you are in the mood to avoid unnecessary conversations? What then? Well in that case, don’t get the Xperia Duo. So if you are an introvert then don’t bother investing in this product. Get a pair of noise cancelling headphones instead. 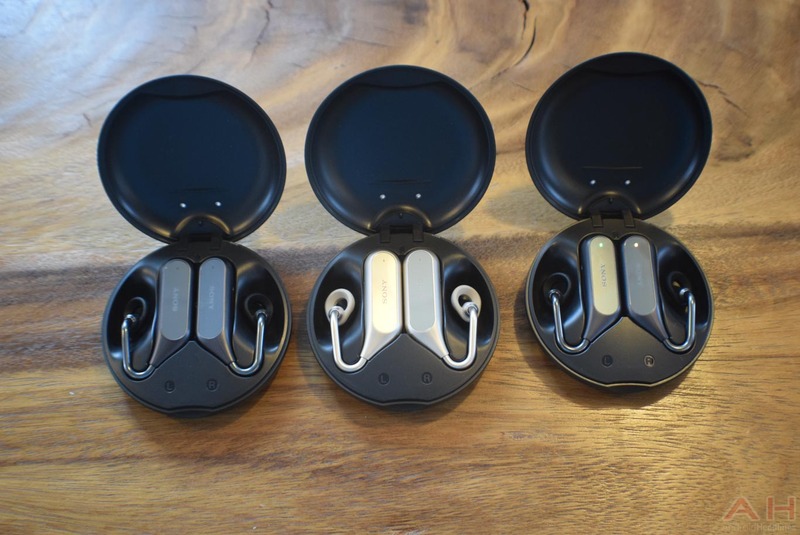 The company has claimed that the earbuds have the capability of “contextual sensing and automatic activity recognition.” Possibly some of the functions may require an app. The Ear Duo supports tap controls as well as head gestures (nod your head to answer a call or shake it to decline the call). You can change tracks my turning your head right or left. According to the company they can survive for 4 hours on a charge and the case will give you with an extra 3 hours of charging. You can get your hands on the ear buds in late May and they will be shipped in a black or gold color.